How far have *I* come then??!! Yesterday I helped a friend train another friend. It was an “introduction to Crossfit” session, and I was there as unofficial photographer. About halfway through the session tyre flips were involved, and second friend said “I want to see *HER* do them!” at me. Without even giving the matter a second thought I grabbed the tyre and started flipping. Down the course and back. Skinny jeans, light coloured shirt and all. Because I could. And yes, I went all Little Ms Competitive on the way back and beat my out time by two seconds thankyouverymuch. So last night I was reflecting on who I am now and who I used to be. My wedding day was the most amazing day of my life. And thanks to a kick-arse photographer, an amazing dressmaker. copious quantities of boning, and the most awesome hair and makeup artist ever, I looked as good as I could have. I look back at my photos and love them, despite the saggy arms, rolls of back fat and big tummy. I still think I looked good, but I looked good for a fat chick. The difference between then-me and now-me amazes even me! I still have a bit of pudge that I need to get rid of. 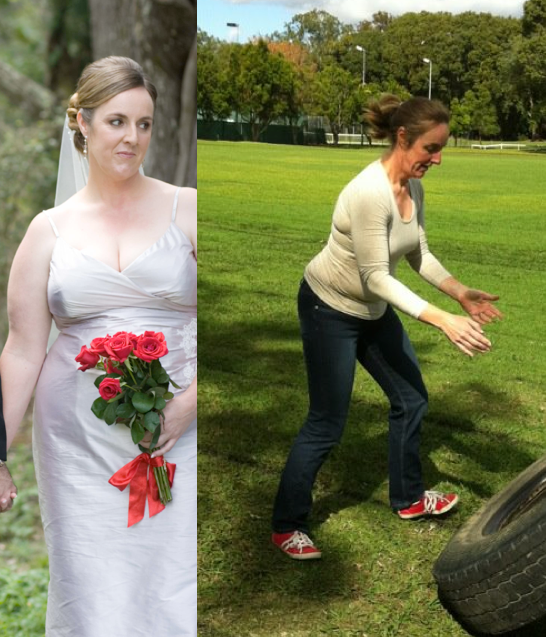 But it’s not even the weight and size loss, it’s the fact that I was throwing tyres around in the park, and I didn’t even consider not doing it! When my friend called me out on it I just did it. No questioning whether I was capable (I knew I was), no second guessing, it just happened. And relatively easily as well. I am beginning to love me. And from where I was, that’s a massive step in the right direction.